Gastroenterologist, public speaker and advisor for the CCFA Fred Saibil wrote the first edition of the book in 1996. Since then, two more editions are on the market- the revised 2003 edition that I own (and that I am writing about) and the newest 2009 edition (that has two extra chapters and appendices on different diets, foods high in iron and a guide on calcium intake). Now, 2003 is not exactly brand new and neither is 2009, when you think of how much can change research-wise. 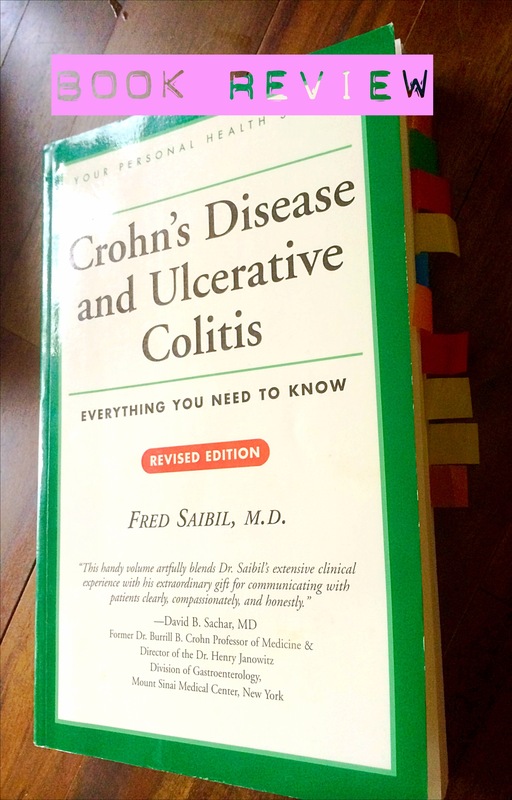 I still think that Dr. Saibil’s book is a great intro for anyone who wants to know about Crohn’s. I bought it in 2004 on a whim. At that point I had had Crohn’s for 19 years, and there weren’t too many things I didn’t know about the disease. And yet, I ended up thoroughly enjoying the book (as much as you can enjoy Crohn’s related stuff). One of the reasons is his writing style- he writes clearly, and explains complex concepts in a simple manner. The sections are written in an easily digestable (forgive the pun) Q&A style (e.g. How does an abscess form?) This is ideal when you try to explain to your Aunt Trudy over Thanksgiving that you really don’t want the seventh helping of her nasty green bean casserole and that no, you don’t have “diabetes or something.” Tackling all the different forms of surgery and topics related to Crohn’s and Colitis in about 200 pages is no small feat. Obviously, he can’t go into too much detail, but it does provide a great overview. Now, if you like shiny, colorful pictures (and I do! ), then I have bad news for you- it doesn’t have that, and for that I find the paperback price of $19.95 a little steep. So get the kindle version or a used version of the book.